Some days there’s nothing better than a bowl of chips, salsa and an ice cold margarita. Or that’s what they say. I never order margaritas. I always order beer or wine with my chips because margaritas are more of a dessert and they fill you up and ruin the meal. Margarita Pie is perfect because it’s a cold margarita in pie-form! It’s a popular pie, but I noticed there were several different ways to make it and this one (adapted from The Pepper Lady, Jean Andrews) sounded particularly good. I didn’t have Cinco de Mayo in mind when I started in on this, but it would be perfect for the occasion. 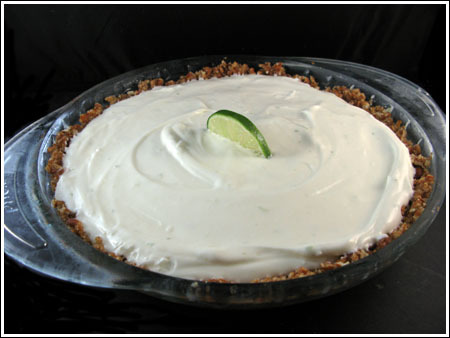 Frozen Margarita Pie made with a delicious pretzel crust. Melt the butter in a large microwave-safe bowl. Stir in the sugar and crushed pretzels. Press pretzel mixture across bottom and up sides of a greased glass pie plate. Keep chilled until ready to use. Make filling. In a large mixing bowl, stir together the condensed milk, lime juice, lime zest, Triple Sec and Tequila. Whip the cream with an electric mixer and fold the unsweetened whipped cream into the condensed milk mixture. Pour into pie shell. Freeze for about an hour or until firm, then wrap tightly in plastic wrap and freeze for 4 more hours. About a half hour before serving, remove from freezer and serve. Garnish with sweetened whipped cream. Did you use regular pretzels or salted pretzels? For dessert, this is perfect! And, lucky for me, it doesn’t require baking. I actually think I might be able to handle this. You’re right, it would be great for Cinco de Mayo! Thanks! This sounds great! I love the idea of using pretzels for the crust.